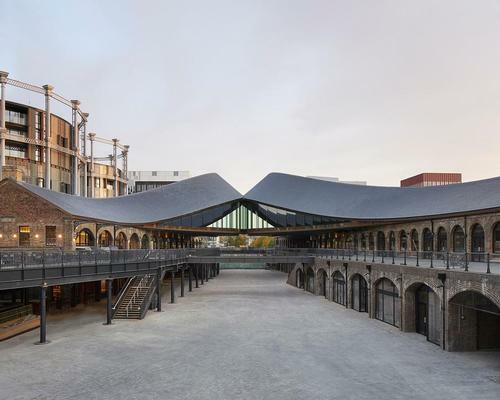 Coal Drops Yard – a historic development which draws on Victorian aesthetics – has opened next to Granary Square in London. Designed by Thomas Heatherwick Studio, the 100,000sq ft, hybrid structure occupies the site of a 19th-century coal transport facility and includes new public space as well as 60 units for multiple shops and restaurants. Originally built in the 1850s to transfer coal from rail wagons to road carts, the site became a legendary hub for semi-secret raves in the 1980s and ‘90s – but has never before been officially open to the public. The Heatherwick team's design, which features a ribbon-like, 'kissing roof', has been described as a marrying of modern engineering with Victorian ideals. Lisa Finlay, Group Leader on the project told CLAD: "I think there was a level of ambition that we think the Victorians would be proud of. When the Victorians did something, they did it completely and wholeheartedly. "That’s what this intervention is about; it’s not a polite, standalone modern intervention sitting next to a historic building. It’s completely integrated. Many of the original trusses, flooring, and paint markings, and brackets have been preserved." Tamsin Green, lead architect said: "The buildings have had different lifetimes: warehousing, nightclubs, and Coal Drops, and we’ve tried to preserve things from each of those time frames." Coal Drops Yard, which officially opens to the public on 26 October, is Heatherwick's first major building to be completed in London.